Brussels inaugurated a square named after assassinated Congolese independence hero Patrice Lumumba on Saturday in what campaigners called Belgium’s first major step towards tackling its dark colonial legacy. Hundreds of supporters cheered as campaigners and officials unveiled a blue plaque bearing Lumumba’s name in the square, which is at the entrance to the Belgian capital’s largely Congolese Matonge area. 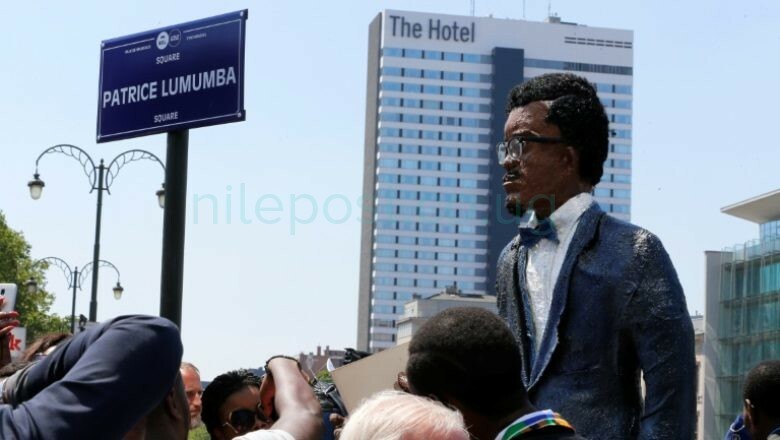 It is the first public area in the former colonial power to honour Lumumba, who was killed in 1961 in an incident in which Belgium itself was implicated along with the CIA and British intelligence. “Today, in the heart of Brussels, by inaugurating Patrice Lumumba Square, we are starting to write our own history,” Brussels mayor Philippe Close, who had backed the campaign for a formal honour for Lumumba, told the crowd. “I want this to be an illustrious day that you will keep in your hearts,” the socialist mayor said. After a rousing series of speeches at an inauguration ceremony attended by Lumumba’s family members under blazing hot sun, live music played throughout the afternoon in celebration. Campaigner Leslie Makoso hailed the “noble and just battle” for a square to honour Lumumba and said it was a victory for “multiculturalism and pluralism”. But she also railed against the exploitation of the Democratic Republic of Congo’s rich natural resources by “neocolonialism”. Several speakers criticised the fact that statues to Belgium’s King Leopold II are still visible everywhere in Brussels, despite the horrors of his brutal rule over the Congo in the late 19th and early 20th century. Other statues to colonialist figures in Brussels still honour the “heroes” who “brought civilisation to the Congo”. The Congolese community in Brussels has been campaigning for years for some kind of memorial to Lumumba. The gesture comes on the 60th anniversary of the 1958 Brussels Expo, which included a “Congolese village” — effectively a human zoo — that was meant to show Belgium’s colonial power. Popular at home, he was considered too pro-Soviet by the Americans and was assassinated on January 17, 1961, at the age of 35, with the alleged complicity of the CIA, Britain’s MI6, and Belgian intelligence. Lumumba was killed after a coup led by Joseph-Desire Mobutu, who renamed the country Zaire. It is now known as the Democratic Republic of Congo. Belgium officially apologised in 2002 when the then foreign minister acknowledged that “some members of the government of the time and some Belgian figures had an irrefutable responsiblity in the events that led to the death of Patrice Lumumba”. Close, the Brussels city mayor, said he had taken action to push through the move to honour Lumumba after other local officials had stalled for years. “This symbol has been called for for 13 years by certain campaigners. I had a majority (in his district), so I seized the opportunity,” he told AFP before the ceremony. The local council eventually unanimously approved the square honouring Lumumba in April. But the move has sparked accusations of “hypocrisy” on the part of Belgian officials. “I think it’s pointless naming a square after Lumumba, there are too many other things that have to be sorted out first,” said historian Natou Sakombi, the daughter of refugees who fled the Mobutu dictatorship in the 1980s. One protester briefly disrupted the mayor’s speech by shouting and blowing a whistle before he was led away by police. It was not immediately clear what his objection to the ceremony was.